Now that you're on your way and determined to have a food storage... CONGRATULATIONS!! This is a BIG step and honestly, the rest is much easier. 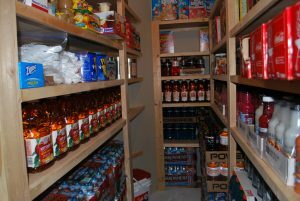 Knowing and understanding that this is important to have a food storage will get you so excited. When you start seeing 1, 2, 3 cans of food turn into several shelves of food... well, you'll just get more excited. So, what is the next step? You'll need to find a smart place to store the food. This can be tricky if you have a small apartment or if you are going to be doing a lot of moving. It's also tricky if you don't have a lot of money. This is very important as food will go bad and be useless or even cause harm if not done right. We don't know when we will need the food storage so we need to plan on storing it for anywhere from 1 month to 2 years. Heat, cold, dryness, and humidity could all ruin food. I'll admit I'm not an expert on this and since it's so important, I've found this information on Family Survival Planning. 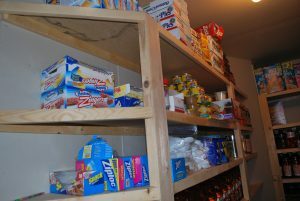 Be sure to check out this article for even more on storing your food storage. "If you live in an area that has four seasons, or very high temperatures and humidity, long term food storage can be difficult. If you live in an area where homes do not have basements, food storage must be kept somewhere in your home at a constant temperature (around 70°F). Cement basements are ideal because they are below ground level (for the most part) and therefore, maintain a pretty constant 50-60°F, which is ideal for long-term food storage. Lacking a basement, just know that the higher the temperatures, the shorter the shelf life of stored foods. But don't let that stop you from getting prepared. "If you live in a hot and humid area: For the best food storage conditions, a dehumidifier would be a good investment. "If you live in a hot and dry area: Air conditioning is the most logical solution, but it takes electricity. Right? That's ok as long as we have electricity. In the days before electricity, people dug root cellars in order to store their garden produce, jerky, and grains in a cooler environment. Is that a possibility for you?" Find out more about Long Term Storage and Short Term Storage on their website. Rotating your food will keep it fresh and keep your family comfortable with the food you have stored. Then if you don't have money for groceries for a few months, you'll already know how to use the food and you'll know your family loves it. The old restaurant rule always applies, FIFO, First In First Out. Knowing and planning to rotate your food will ensure that you're storing it in a way that makes it easier. Another great reason to rotate is to inspect your storage for signs of spoilage or signs of pet infestations. If cans are bulging or seeping liquid from the seal, they will need to be thrown away immediately. Those are almost sure signs of botulism poising, which could be life-threatening. For jars you'll want to check to see if the lid seal is still intact by checking to see if it pops back up when you push down on the top. When you bring home new food to add to your storage or when you take from your food storage to use it, you'll be able to keep track of your inventory. It would show you how much your family is using, how long the items are on the shelf before they are used, and ensure you have stored the proper kinds of foods. Remember that list you made of what you need? Be sure to keep that current during rotation. Every 3 months you'll be able to adjust your purchases to match your families needs. I've tried doing this each time I've gone to the store and it can be difficult. So, doing a family inventory about every 3 months is a good idea. If there is one food that you have never used in those 3 months, consider it. Would it be best to keep adding that particular food? Will your family use it? Is there a certain food you can never catch up on? Maybe you run out of it before you have more to add to it? My first food storage was under beds in the boxes they came in. I cut them in half so they were only one can high and slide them under. Dates written on the top, all I had to do was pull out the box, check the dates, add new cans to the back of the box, and take from the front. I also built storage shelves with cinder blocks and Plywood. We found a bunch of cinder blocks at a friends they weren't using and then had the plywood cut at the hardware store where we bought them. Not great for floor to ceiling shelving, but it worked great for 3-4 shelves high in the garage. Here is a great list of sites that have some super clever ways of storing food. Many of these can be done on a very small budget. 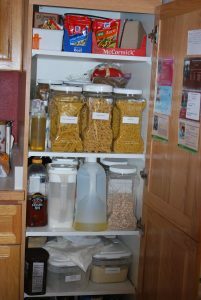 I'd love to see how you are storing your food storage! Leave a comment with a picture or idea below.